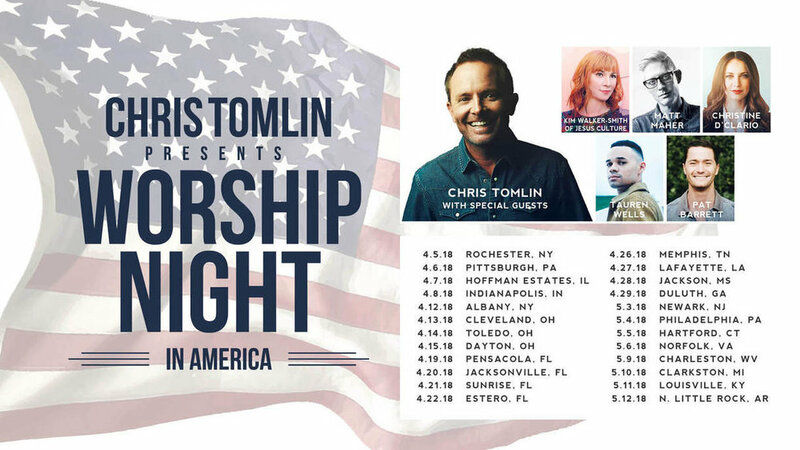 Nashville, Tenn. (Nov. 10, 2017) - GRAMMY® winner Chris Tomlin continues to bring the church together in unity and prayer with his 2018 Worship Night In America (WNIA) tour, kicking off April 5, 2018. Special guests include Kim Walker Smith of Jesus Culture, Matt Maher, Christine D'Clario, Tauren Wells, and Pat Barrett. The tour will hit 24 markets across the U.S. including Chicago, Indianapolis, Atlanta, Philadelphia and more. Chris Tomlin's 2018 "WNIA Tour" follows his 2017 "WNIA Tour" which made 24 stops in arenas with sellouts across the country, including Nashville, where Tomlin made history as the largest ticketed Christian concert at Bridgestone Arena to date. This feat came amidst a massive year for Tomlin, when just last fall, Tomlin became the first Christian artist to receive the SoundExchange Digital Radio Award, recognizing more than 1 billion digital radio plays. Justin Timberlake, Garth Brooks and Pitbull are the only other artists to have received this award. Following this success, Tomlin filled the iconic Red Rocks Amphitheatre for back-to-back nights this past September as the first ever CCM artist to play the historic venue two nights in a row. Tickets for the “Worship Night In America” tour will be available at christomlin.com starting Nov 17 at 10am local time. As a SPECIAL OFFER to early ticket-buyers, a 20% promo code will be active Friday, 10am local time through Monday (11/20), 11:59pm local time using code "INSIDER." *All dates subject to change. For latest information, visit christomlin.com. The "Worship Night In America Tour" is exclusively produced by Awakening Events, presented by K-LOVE and Air1. For additional assets, click here. Likely "the most often sung artist anywhere" according to TIME Magazine, Chris Tomlin is among the most influential artists in Christian music. Selling over 7.5 million albums and 10.7 million digital tracks, Tomlin has 16 No. 1 radio singles, a GRAMMY® Award, three Billboard Music Awards, two platinum and five gold albums to his name. Honored last fall as the fourth recipient of the SoundExchange Digital Radio Award, recognizing more than 1 billion digital radio plays, Tomlin’s latest album Never Lose Sight along with his new book Holy Roar 7 Words That Will Change the Way You Worship are available now. Awakening Events produces over 175 Contemporary Christian concerts and events nationwide in America and is consistently ranked in Pollstar's "Worldwide - Top 50 Promoter" list each year, reaching as high as 9th in North America, and top 20 in the world. For more info visit: www.AwakeningEvents.com.